Thank you Studio Faro for the comments you made on my last post regarding the curved seam draped dress. Spurred on by your encouragement I have made another toile. I started again with the front of the dress and redrafted the curve to end higher on my hip. I also dropped my arm hole by 1.5cm but didn’t add the cap sleeves. I am never sure that cap sleeves suit me and I will probably wear this dress with a jumper underneath so I think a sleeveless style will be more flattering. You will see that the dress itself it much more flattering, I have managed to get rid of the excess at the waist and the pleats are more evenly spread. The armholes still need some work though! 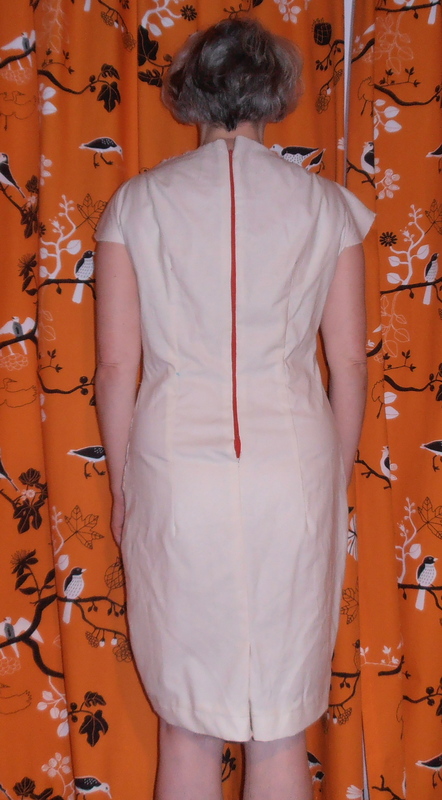 The front here is attached to original back with the cap sleeves so it will look a bit odd. I probably need to make the curve of the armhole a bit deeper and shorten the shoulder seams. Are you followers of Studio Faro’s Pattern Puzzles? I stumbled across them on the internet a few weeks ago and have become completely obsessed. Anita is very generous is sharing her knowledge and manages to explain the most complex patterns in the simplest manner. Curved Seam Dress from Anita McAdam© of Studio Faro. Recently she feature this curved seam dress and I immediately decided that I needed to make one using my block. Drafting the pattern took a couple of hours but the toile was very quick to sew up. So, this is toile number 2. The back and upper front are the same as the original toile. The lower section is the same except I have added a new pleat towards the top and removed the very bottom pleat. I have also sewn the pleats downwards rather than upwards, I’ll probably change the direction on the upper pleats in a finished dress too, stops them from becoming crumb catchers! This is better but I am still not sure. Perhaps my curved seam could do with ending up a few inches higher. I also feel it’s a bit lose around my waist – I may try just pulling it in a bit at the side seams. I also want to rethink those capped sleeves and lower the arm holes a bit further. I have some lovely red stretch crepe from Dragonfly Fabrics which is just crying out to be made into a flatter in dress. What do you think, am I just being too pernickety about my toile and should recognise that calico will never be a flattering fabric? 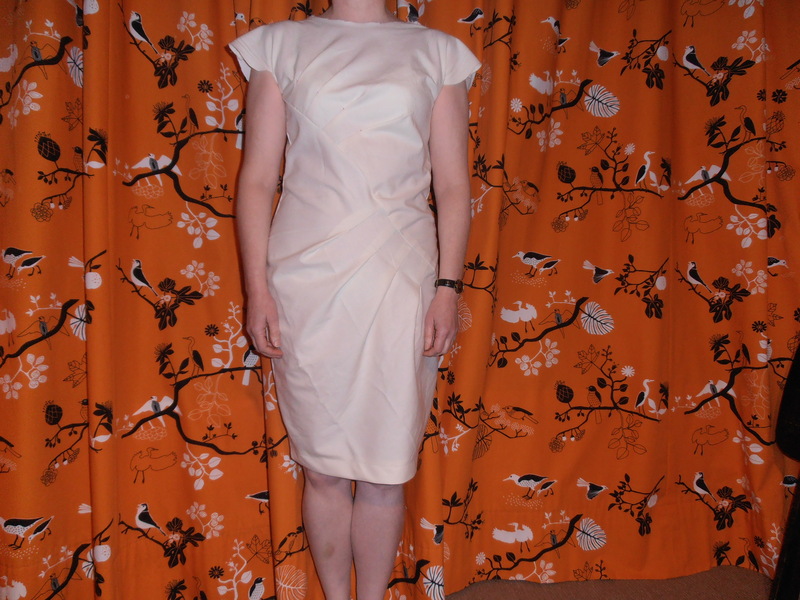 Or do you think I should have another go and make a third toile?